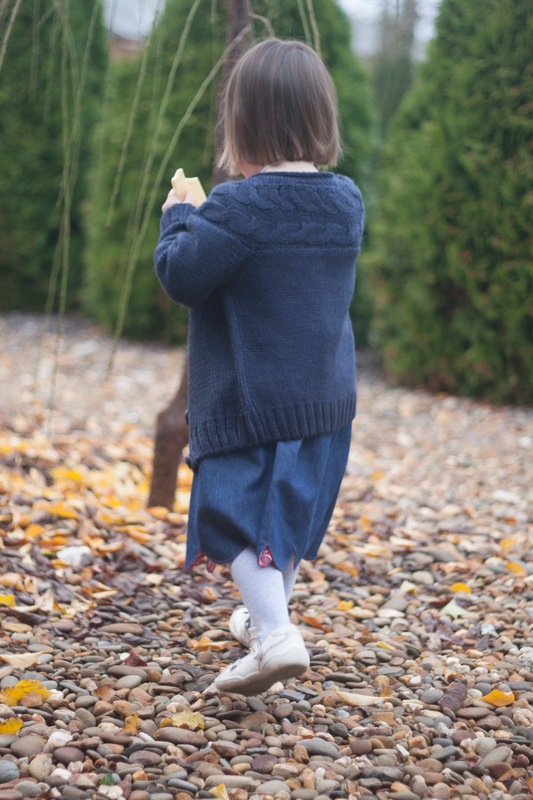 A couple of months ago I wanted to make a denim dress with a scalloped hemline for Little Monkey. I did not have enough denim at home. My local Spotlight store had none in stock and staff told me they were not expecting any more any time soon... True story! 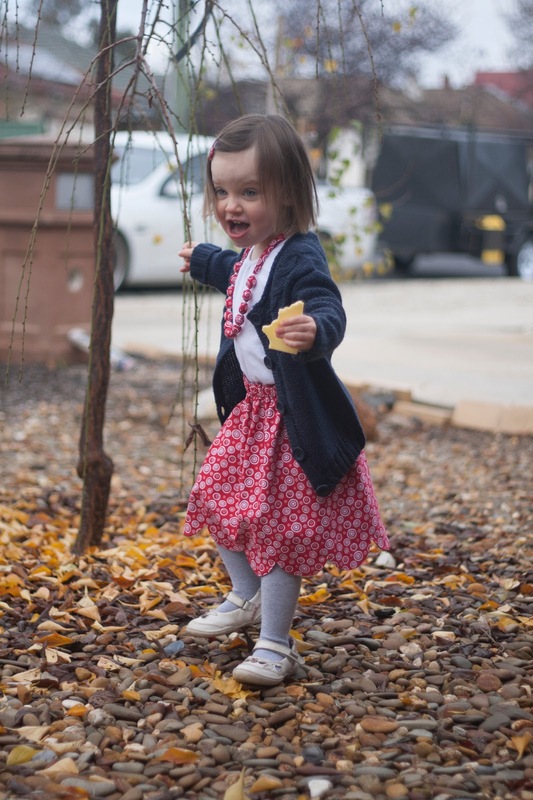 So the craving to make a scalloped dress was left unsatisfied. 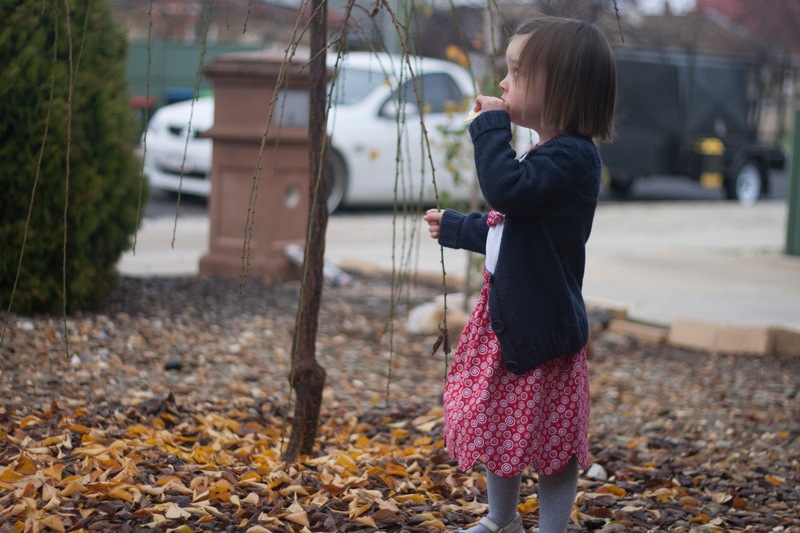 While she was sleeping, I made the Bluebell Skirt for my Little Monkey. I made the skirt long as we have a few cold months ahead. I think Little Monkey will get a lot of wear out of it. This is her favourite skirt now. I thought the skirt required a matching necklace :) You can find a tutorial here. 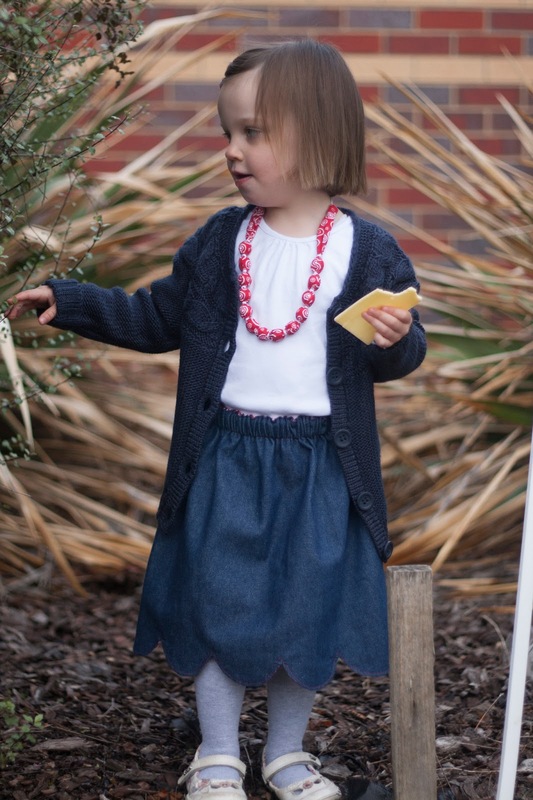 The cool thing about the Bluebell skirt - it is reversible! Ta-da! 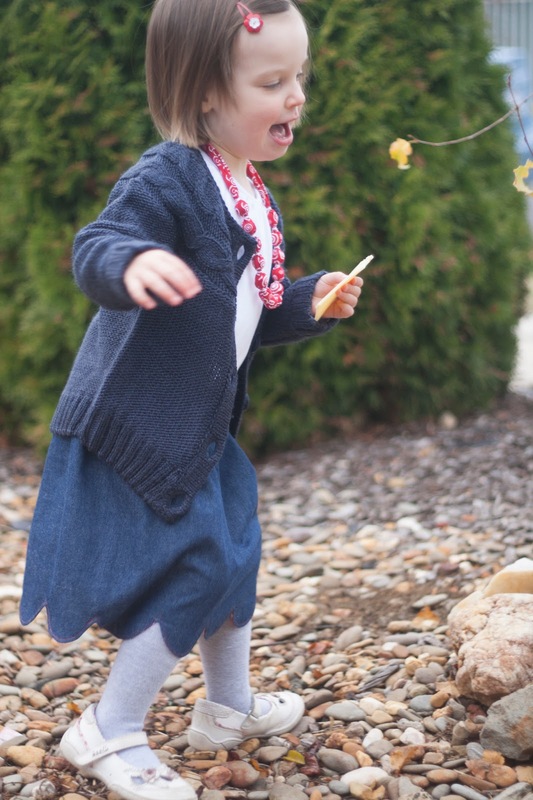 Would you like to make a Bluebell skirt? It is actually not difficult! Please click Read more to see tutorial! First thing first - you will need a pattern. Measure your little one's waist. Let's call it 'Width', or W.
Determine how long you want your skirt to be - above knee? Knee length? Below knee? Now measure your little person from her waist line to the point where you want the skirt to finish. Let's give this measurement a creative name "Length", or L.
If you want a fuller skirt, W x 2. My skirt is about W x 1 1/2. I generally find that skirts look nice when I multiply the waist measurement by 1 1/2 - 2. Don't add seam allowances just yet. 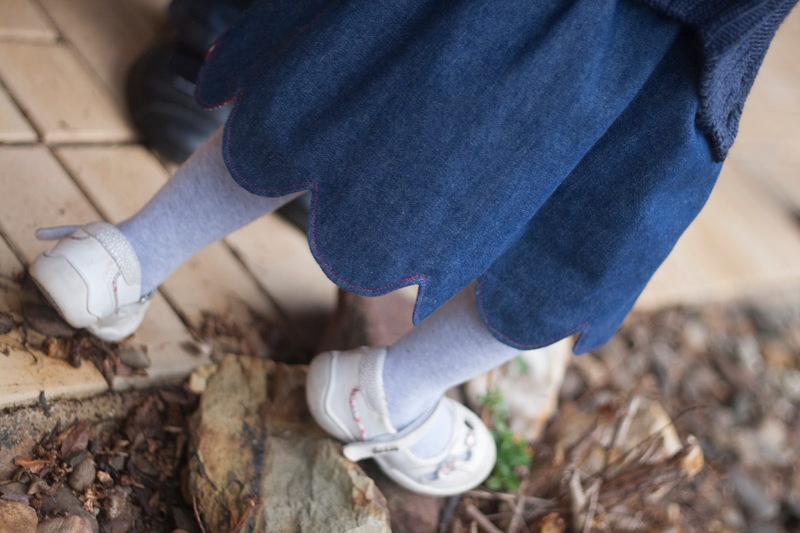 For the length of the skirt, take your little one's measurement L. Don't add seam allowances just yet. Draw a rectangle on paper using measurements W and L.
Play with your pattern until you are happy with how half-circles fit. Once you are happy, it is time to add seam allowances. On my pattern you can see only one seam allowance - on the right hand side. That is because my skirt only has one side seam as the fabric was wide enough. Now transfer your pattern onto fabric. You only need to mark half-circles on either the outer fabric or the lining. Don't cut around the half-circles, but leave a little room underneath them like in the photo below. Pin the sides of the skirt together and sew the side seam/seams. Trim excess fabric and press the seam/seams open. Repeat the above steps for the lining (minus marking the half-circles of course). Next, insert lining inside the skirt, right sides (brightly coloured sides) facing. Carefully cut as close to the corner as possible. Trim around the half-circles to turn them out. Turn the skirt right sides out and press. I don't think I trimmed my corners enough - the fabric gathers a little. I will be more careful next time I make this skirt. Top-stitch. I reckon top-stitching makes the skirt more interesting. My husband agrees. Now it is time to make a casing for the elastic. 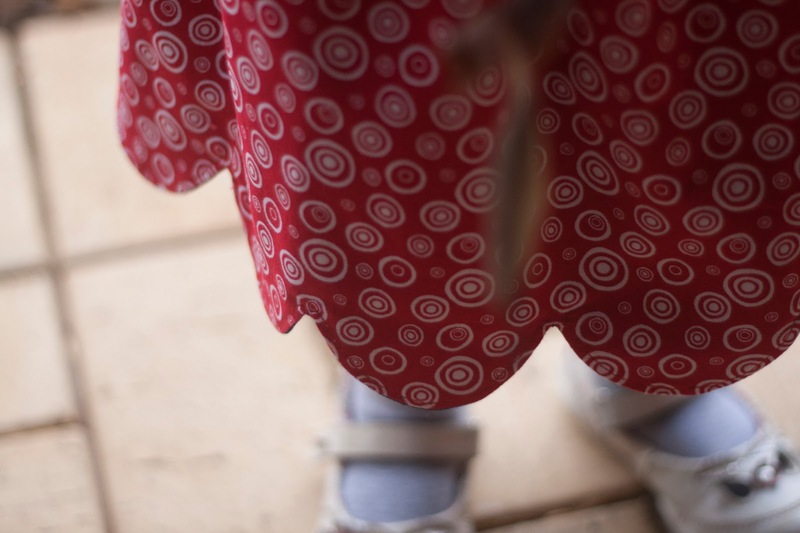 Fold the seam allowance on outer fabric of the skirt inside and press all around the opening. Now, fold your lining fabric inside so it lines up with the outer fabric. Press. Sew along the top of the skirt about 3-5 mm from the edge of the skirt, leaving a small opening for the elastic. Determine how much room you need to comfortably fit the elastic. Markings on my plate only go to 2 cm, and I obviously need more than that. I don't want to be guessing, I hate uneven seams. I need a reliable mark. What can I do when there is none? Let me show you the Jenya method. No marking? No worries. Cut a piece of a post-it-note and sticky-tape it where you need a mark to be. Now the seam should be straight. Thread the elastic through the casing and secure it. 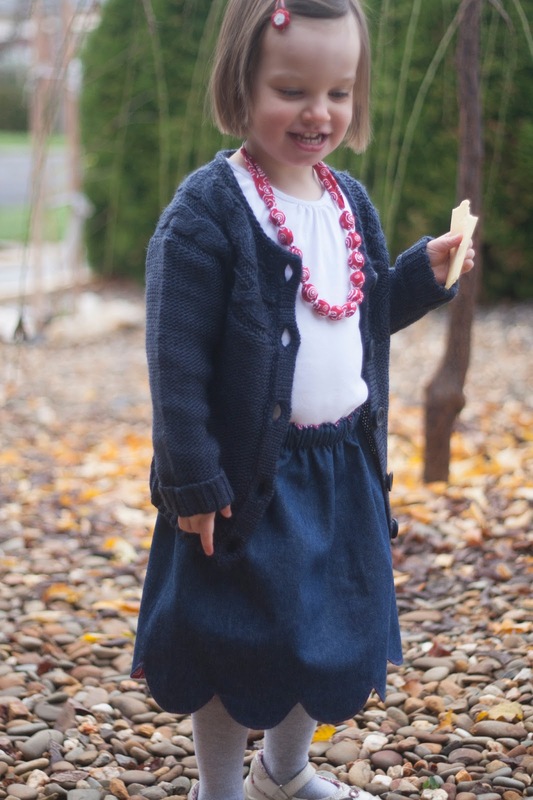 Please let me know if you make the Bluebell skirt using this tutorial. I would love to hear from you and have a look at the pictures (if you take pictures of your creations). I would appreciate a link back to this tutorial should you choose to use it. I love the fact that your skirt is reversible and of course, the scallops look fabulous!!! I'm thrilled you've added your fabulous tutorial, Jenya!!! Cute scallops! This hemline is everywhere now...I'm going to have to try it out! I love scallops and have my own tutorial for scalloped edge shorts which includes a free scallop pattern that you can download. Very cute! I love this so much! I also love your blog! I would love if you checked out my blog! 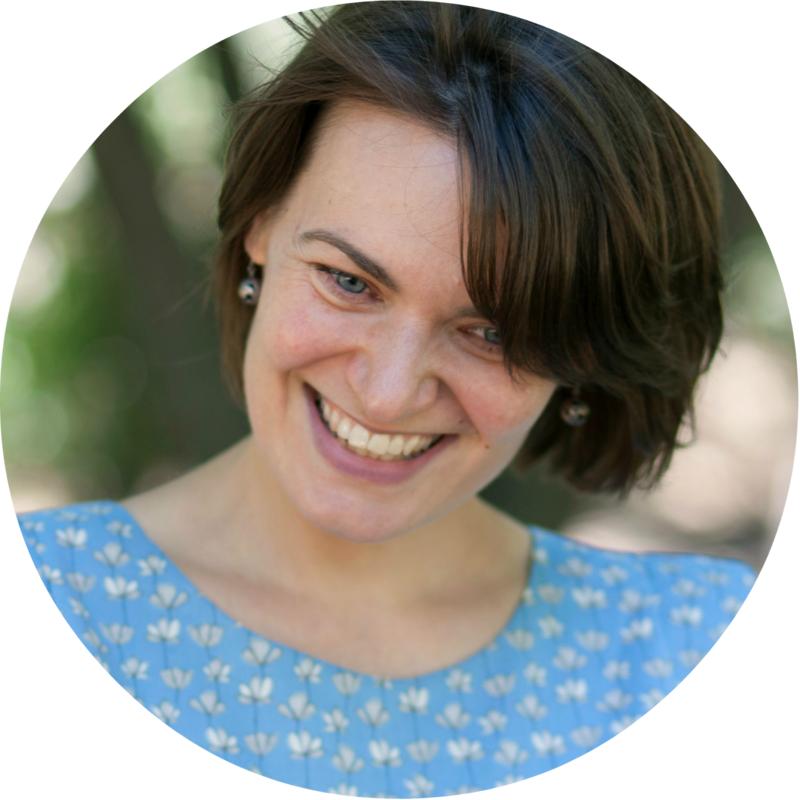 Kiana, your blog is wonderful! I love your attention to detail. I cannot believe you are only 13! Well done :) Please continue crafting, you are so good at it! This is really cute ... 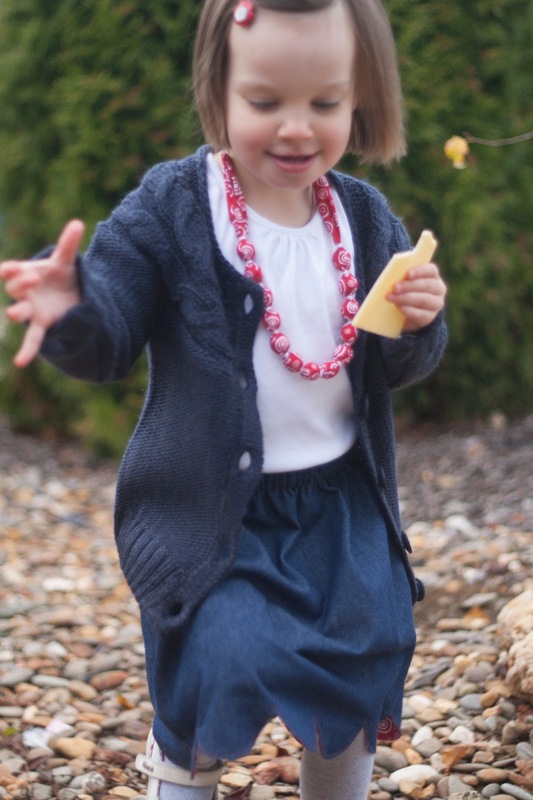 I attempted a pair of scalloped shorts last summer for my munchkin, which were an epic fail ... I think I'll try your method and see how I go. I'm thinking some dusty pink corduroy for one side ... hmmm! Thanks for this!! 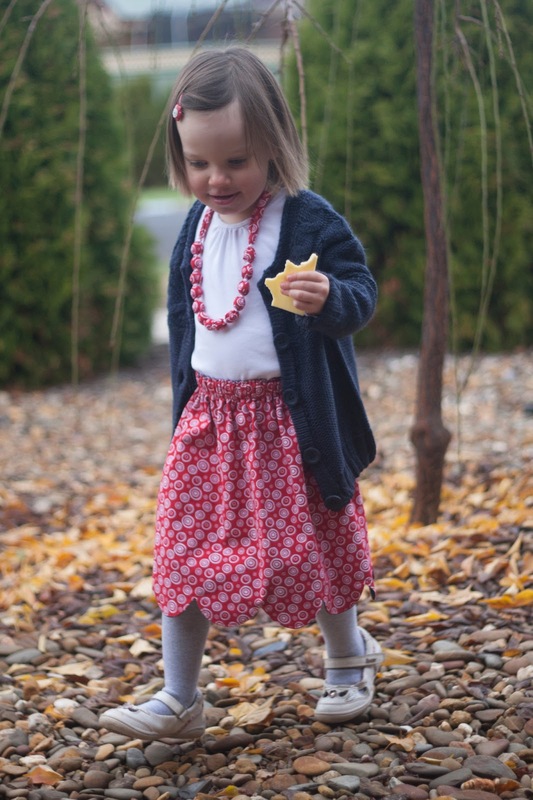 Thank you Wen :) Please let me know if you end up making a skirt for your munchkin :) Dusty pink corduroy - lovely! 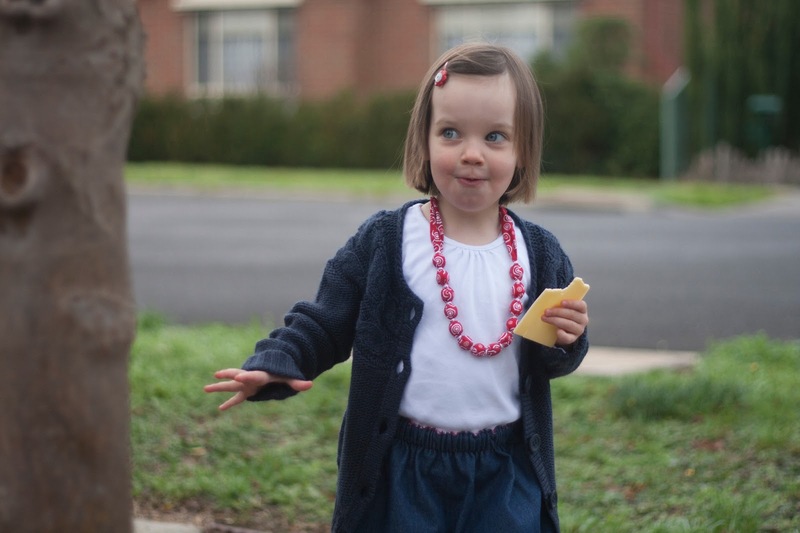 Just browsing through your blog - you make gorgeous things! and the meals - they look yum!!! This needs pockets and to be for adults too! I enjoy wearing skirts year-round and think this pattern would be good for other fabrics and sizes. Great tutorial, too. Sorry I did not reply earlier, I am not receiving all notifications. I am trying to sort this out. I like the post it note idea. A magnet or painters tape works well also. Thank you for the fabulous tutorial, I made a skirt for my little monster today, I'll share some photos with you when I get her to stand still in it long enough! She's very pleased with it. Oh your version is so beautiful! Liberty... mmmm!!! Hi Carolyn, I can't see why it won't work :) Have fun!